Last night I attended the opening night of the Tony Award Winning Musical “A Gentleman’s Guide to Love and Murder”, on stage in Toronto at The Princess of Wales Theatre. It was my first commercial theatre outing since returning home after two years in Calgary, and a riotous good time. If like good old-fashioned farce with a dark comedic edge, then this show is for you. The show, based on the book by the same name, tells the story of Monty Navarro (Kevin Massey), a man who has just buried his mother and discovers that he is actually a member of the royal D’Ysquith family. An old family friend attends the funeral to inform Monty that the family disowned his mother for marrying an ‘undesirable’, condemning Monty to a life of poverty. Further complicating matters, he has fallen in love with Sibella (Kristen Beth Williams), a woman who desires a man with fortune and prestige, so he decides to systematically eliminate the D’Ysquiths who stand between him and the title of Earl of Highhurst. After all, what’s a little murder when love is on the line? What ensues is a hilarious and increasingly creative series of events as Monty tries to dispatch each relative stopping him from claiming his place on the throne. Playing the various members of the D’Ysquith family is John Rapson, who transitions effortlessly from current Earl of Highhurst to countryside beekeeper, family Priest and even an over the top globe trotting female D’Ysquith. It takes skill (and one would imagine impressive quick change abilities) to play such a diverse group of oddballs, but Rapson excels in embodying each character and proves a worthy adversary to Massey’s more likeable and nuanced Monty. Their duet “It’s Better With a Man” was one of the highlights of the evening, eliciting uproars from the audience with its endless slew of intelligent double entendres. Of course, what would a farce be without a bit of misdirection and confusion? Thankfully the intelligent book by Robert Freedman provides a love triangle by having Monty win the affection of distant D’Ysquith cousin Phoebe (Adrienne Eller). Phoebe proclaims she wishes to marry Monty at the exact moment Sibella decides that she does in fact love him. Their mutual affection proves quite useful for our hero when he finds himself on trial for (rather ironically) the one murder he didn’t commit. 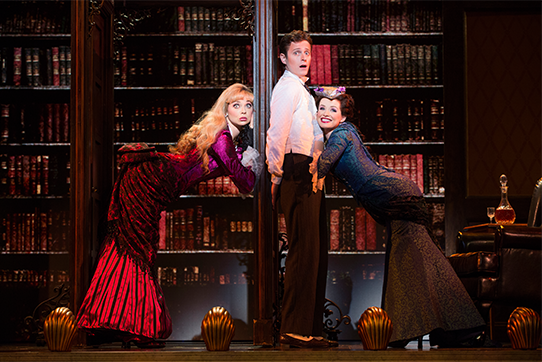 It’s easy to see why the show won the 2014 Tony Award for Best Musical, and the touring production does not disappoint. It’s clever, funny and expertly directed by Darko Tresnjak. It’s deliciously dark with witty music by Steven Lutvak that had the audience in stitches even as blood, guts and bodies flew across the stage. The talented cast sing their hearts out, while the creative use of projections and set design allow for some of the most elaborate death scenes I’ve seen on stage in a long time. There is plenty of love and laughter to offset the morbidity, and that delicate balance of light and dark is what makes A Gentleman’s Guide to Love and Murder so much fun. « Happy 5th Birthday to Singular Sensation – Toronto’s Musical Theatre Open Mic Night!